BJ recently gave me quite the bundle of old job photos. So, you may be overwhelmed with MGS by Design's old job pictures for awhile here. It's kind of fun for me to go back and see what we've done. This picture is of Noce Travertine with a 2 1/2" Half Moon Edge Detail. I really like those square undermount sinks! Love everything about this. 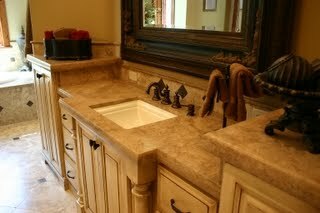 The sinks, the travertine and the varied countertop heights. Thanks Melissa! I really like the varied height countertops as well.